Dina Hart and her family have been fostering for Lu’s Labs since 2015. During that time she has graciously opened her home to countless puppies and dogs. You know all those happy puppy pictures of families with their new pups? Many of those come from Dina’s house! Her children have had the pleasure of “wake up duty” by the puppies and dogs fostered by Dina led by Dina’s yellow lab, Lucky. Their other dog, Buster, isn’t into wake up duty! Dina’s children and their friends take an active role in fostering, and are always willing to lend a hand. The kids have been instrumental in creating and running a yearly local fundraising events in Arlington, VA. Kids Helping Canines. Her two sons along with their friends have setup the activities including baking dog treats, a doggie kissing booth, games for neighborhood kids and face painting. 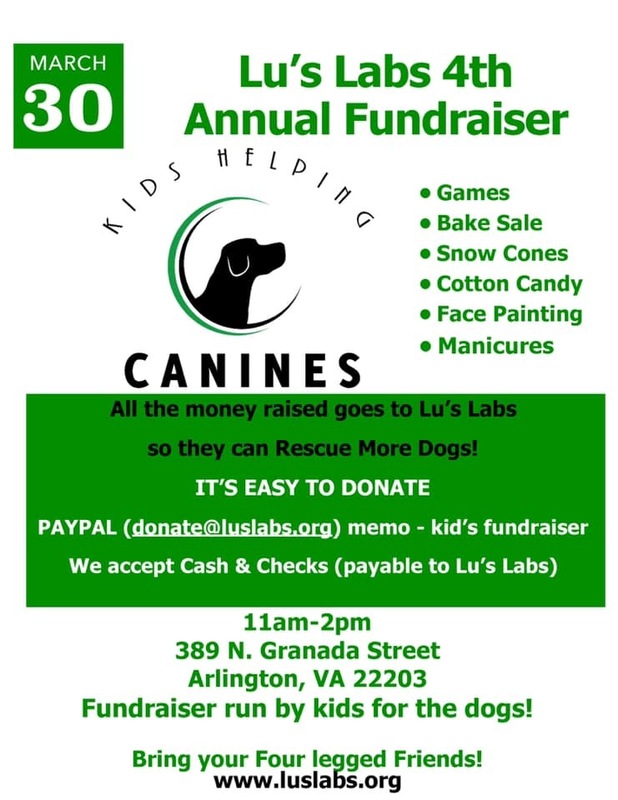 This year marks their 4th annual fundraiser in the Hart’s Arlington, VA neighborhood with proceeds benefiting Lu’s Labs. This Saturday March 30 between 11 a.m. and 2 p.m., stop by to enjoy the activities and meet up with other Lu’s Labs Alumni. Come meet the Hart family along with their friends and neighbors. On our Alumni group we get to see all the wonderful homes and love our adopters give to their Lu’s Labs. We have amazing people who have adopted our rescues and made them members of their family. It is always so much fun during the holiday season to see so much love for our pups. Here are just a few of the many heartwarming pictures we get to see of the new lives our rescue efforts have provided for these special dogs. To all of our current and future adopters we love you for what you do for the Labs we rescue, and we look forward to many more lives saved in 2019. As part of the Lu’s Labs family all our adopters are welcome to join our private alumni group and share pictures with us. All the volunteers love to see new new lives these dogs get to experience thanks to everyone’s hard work and caring. Sammie is now ready for adoption and needs that super special family that is not only ready to get one of the sweetest kinds of chocolate ever but is also looking to be a rescue angel. Sometimes very special dogs go on medical hold and cannot be adopted until we figure out and learn what their needs are. This was the case with Sammie the sweetheart! When she first came into rescue this girl was very over weight. Last month, we discovered five-year-old Sammie has diabetes and arthritis. This is a very manageable situation in dogs, just like it is in people, and should not stop Sammie, the gentlest and kindest soul, from finding a forever family of her own. This beautiful girl is the perfect companion and has been so good while we have worked on stabilizing her glucose level. She is currently eating prescription food, takes insulin twice a day and takes rimadyl for her arthritis. She is a champ and stands perfectly still for her injections, she really is a gem. Unfortunately, due to the diabetes, Sammie has lost her vision as of this past Friday; the vet thinks she can see extreme light and dark. The good news is once her diabetes is stable, Lu’s Labs will pay for surgery to remove the cataracts and her vision will be restored. Families who are considering her should know Sammie’s immediate future will consist of vet visits every week or two until the diabetes is stable, which means her glucose is at a manageable level. Then, the visits will be less frequent. Her family should expect to test her glucose level at home and monitor it as you would with a human. Personality-wise, Sammie continues to be a doll. She follows her foster mom everywhere; she’s a little slower since losing her vision, but we all walk cautiously when blindfolded. She follows her foster dog brother and her favorite cat around the house and listens to where they are going. Sometimes, they go in opposite directions, so she has to choose which one she wants to follow. Watching her decide is the cutest thing! She listens when foster brother is chewing on a bone and the moment he stops chewing, she moves in and take it from him and tests it out. She keeps foster mom company while she is cooking dinner and sits at her feet while she eats. She has free reign of the house during the day with all the dogs and cats and doesn’t need to be crated. The vet says she can be adopted anytime as long as the family is committed to her care. If you would like to care for and love this perfect girl, she is going to love you right back ten-fold. Not only are you getting an amazing family pet, you are truly being the rescue angel we try to find for all of our dogs. An estimated Care Cost for Ms. Sammie to include prescription food, insulin, and medicine to help her arthritis is about $290 - $325 per month when you use Chewy.com for food, and Walmart or Costco for prescriptions. This price may change if her diet or medicine needs to be adjusted or if you purchase from more expensive options. There is no doubt that a day in the life of Iris has changed dramatically since she came into rescue. She started out on the streets of Puerto Rico. We can’t know if she had a family, lived in doors during her life, or had the love of people. But now she’s making up for lost time. This gentle senior is about 9 years-old and has some snowy touches in her beard and frosting on her paws. Age is always a guess in rescue, but she has the gentle being of an older soul. She loves her people and will make you feel like you have hung the moon. Given the chance, Iris will follow you around, but because she doesn’t get up on furniture it’s not too much. She’s not great with stairs, so a ranch home with no steps, and rugs and runners will be her ideal home. She has the lab lean down, and will lean into you for affection, and put her head in your lap. She is so chill, she will just gaze into your eyes lovingly putting a spell on you to pet her. She doesn’t let anything bother her. In an active foster home full of 5 dogs and 2 cats she sits back and observes, she doesn’t play, but she watches and wags. When other dogs lay near her, she doesn’t move away, she just has a Zen dog air about her. When cats get too close, she nudges them with her nose, and they fall right over. It’s a very gentle relationship. Iris LOVES food. She has a very happy tap dance, where she stomps here feet and bounces like a puppy with her feet about 6 inches off the ground. She loves the sound of a treat bag and her true spirit comes out. She takes treats gently and will sit for treats. She doesn’t need a lot of play time or outdoor time though she loves her short walks and is a dream on a leash. Nothing phases her. She is beyond her squirrel chasing days. Easy should be Iris’s middle name. You could actually stroll with a full cup of coffee with this girl and never worry about spilling it. Sniffing the air, wagging her tail, and strolling along at a slow pace is her thing. After about 5-10 minutes she’s lagging behind foster mom, so long walks are probably out. This gentle soul never chews on anything and doesn’t need a crate. She doesn’t play with toys, but she has a funny habit, when foster mom is out. Iris only does this when no one is around. She will take the throw pillows off the couch. There’s no sign of chewing or slobbering. We aren’t sure if she’s laying on them, or if it’s a commentary on the colors and patterns. Maybe she has a little Martha Stewart in her, and she’s telling foster mom to redecorate. This girl does love her car rides. If she has access, she will go into the garage and sit by the car until you come out and put her in for a ride. She loves calmly watching the world pass by. When she’s had enough, she will lay down and go to sleep. It’s funny how adamant she is about her car rides. Her focus is intense, and you can’t call her back from the garage when she’s ready for her car ride. This works out perfectly for short errands. She strolls around PetSmart and Home Depot with her leash wrapped around the cart. Just like her quick walks she enjoys quick errands that won’t take all day and tire her out. A day in the life of Iris is a mellow loving experience. She will be perfect for anyone looking for that home body dog who wants to go for car rides, and short strolls and just love you and be loved. The sun will rise and set around you in her eyes, especially if you have crinkly treat bags nearby. Her tail will wag when she hears you coming, and her eyes will tell you all about her love for you. This beauty is still looking for a home. Could that be your home? Willow is Lu’s Labs best kept secret. She is actually a success story that needs to be told. Remember success comes in many forms so as you read this tale of where we are from where we were, you have to give Willow high fives and breathe a sigh of relief for this girl. She’s come so far, and now we only ask that we find the perfect home that will take this love in and make her their own and help her continue on her path to healing. Today, you wouldn’t know the journey she has been on. This happy go lucky affectionate girl knows all her commands, is fine in and out of a crate, and loves her people. She loves children and one of her favorite things is to find a patch of sunlight in the backyard and bath in it. This smart loving girl gives kisses and has figured out every puzzle game. She can be redirected from barking with treats and she has never destroyed anything. No counter surfing, no chewing on things that don’t belong to her, and she likes to be touching you, and when she truly trusts you she may even end up curled up in your lap or sleeping with you in bed. But this wonderful girl will not fit the rule of 3’s. She will not be quite like this in the first 3 days, or 3 weeks. She needs time. And you need to know her story. This lovely black 4-year old girl came to Lu’s Labs from Louisiana and was adopted in July of 2017. At the time she was leash reactive and a barker. While the adopters worked with her with a trainer, they were exhausted with a new baby, and they lived in a very social environment with lots of dogs in the neighborhood. This just wasn’t an environment for Willow, so she came back to us in February of 2018. The adopters were so sad to see her go and continued to check up on her. With so much change, Willow became even more dog reactive. If she saw a dog out the window she would bark for hours on end and could not be redirected. This was a hard situation because she is such a love. She is great with people. She is like a little kid, she is a creature of routines. Her favorite game is to pull all her toys out of the toy box looking for a squeaky toy that her adopters gave her. She has been so gentle with it and rolls over on her back and hugs the toy. Intelligence in this dog is an understatement. She can complete every puzzle game and learns fast. She was generally anxious but if kept focused in the house she was fine. Her foster family could not even take her for an evaluation with a behaviorist because at the front door she could hear other dogs barking and she wouldn’t go in. She was beside herself at every dog that passed by the windows and would be spread eagle across the couch barking her heart out. Finally, a trainer came in to do an evaluation and suggested covering the windows. This began to help. The vet put her on doggy Prozac and Clonidine which was basically like a doggy tranquilizer. Even increasing to maximum doses only had a minimal effect. This poor baby was stressed. And her day of reckoning was coming. The hardest discussion to have in rescue is whether or not it’s time to have to put a dog down. What kind of life was Willow living? Constant anxiety, stress, and fear was not a good quality of life for the dog. We never take the task of putting a dog down lightly, and her foster was attached to this barking mass of nerves. “She is a really sweet dog. If she was a maniac and not a sweet or smart dog, or there was nothing precious about her, I don’t know if I would have been pushing so hard for more time. She was unhappy. She had her bouts of sweetness and you could see her come through.” Her foster mom wanted to make sure we investigated every avenue before making the final decision on Willow. No one wanted to see her have to make that trip over the rainbow bridge at just 4 years old. When foster mom raised the idea of CBD oil, the board deliberated over this new method. This would be the last attempt to see if we could find better results for Willow’s extreme reactivity. We researched it and made sure it was safe before beginning treatment. The results were like night and day! Once we began the CBD oil with Willow her whole life changed, and the world opened up to her. Where she used to bark for hours on end at the German Shephard next door, now she can be out in the yard and if he comes to the fence she may bark a couple times, but she can be redirected. In 5 months with her foster, she is a completely different dog after a month of treatment on CBD oil. She is going for more walks and can be redirected from barking. She loves all the children in the neighborhood and every person she meets. Willow is a smart girl and knows commands like sit, down, stay, (come) here, and leave it. Treats motivate her, and she can be redirected now with the aid of the CBD oil. This girl needs a patient forever home. A family that realizes this jewel is worth waiting for. It may take a couple of months for her to settle in, but once she does, her love and affection shines through. Over time she has become so comfortable she can cuddle up into foster mom’s lap after dinner and watch TV. While not a huge cuddler she is learning to give kisses. She is great with kids and people and is becoming less anxious and reactive thanks to the CBD oil. Her first adopters really loved her, tried hard with her, and wanted to keep her. But the barking and the new baby just were not conducive and the attention that was needed for Willow was just not available. She needs a home that will love her where she is and want to constantly work with her to provide love, comfort and training to continue her on her journey of healing and happiness. Will You Be My Valentine - This is the Girl for You! I can’t believe there are 54 adorable photos of me and yet still no one is stepping up to give me a forever home. I am truly an awesome, loving dog. I had a rough start when I came into rescue. I was found along with my 6 puppies, but I took wonderful care of them and they all found amazing homes. I am approximately 2 years old and weighing in at 44 pounds - I’m the perfect size. Not too big and not too small. I’m like a pocket lab. I wish I could tell you more about my early years, but I’ve blocked that time out. It was not the loving environment I’ve experienced at my foster mom’s home. Once my babies were all adopted I went down to Richmond to live with this nice lady while I went through my heartworm treatment. She is patient and loving and her kids who are home from college think I am an awesome dog. I absolutely love my people. Being the fly weight that I am I make the perfect lap dog. In my early weeks with the rescue, I was still figuring things out. I had never experienced love before, so naturally I was a little fearful. As time has progressed though I am quite comfortable in my own skin. Let’s face it, I kind of own my foster mom’s house, and all the people know I’m a soft black ball of love. I love the outdoors, and I equally love to chase squirrels, but what healthy happy dog doesn’t? I’m good in and out of my crate, I don’t need to be fed in there, but if you want me to eat in my crate I will. I have no problem with that thing these days, but my preferred happy place is to be as close to humans as possible. If you let me snuggle in your bed I will spoon with you. But if you want me to sleep on the floor I will respect your space, and only come up when invited. I’ll do anything for a treat. Just so you know. And my happy dance? It could be on So You Think You Can Dance. I do the happy dance whenever I see my people when they come home, when they let me out of my crate, I’m just a super happy girl. Foster mom says I have an innate ability to sense when someone needs love, because if she’s feeling sad, I’m Johnny on the spot with kisses and nudges to make sure she’s okay. With all this love I lavish upon people it should be a small ask that I have my own yard, and you understand that I may not take kindly to other dogs. I need to be an only child, and come on, with all the love I have to give, I really don’t see why you’d need any other pet. It’s just a fact. I’m gonna bark at other dogs. But I am rock solid in a thunder storm and I don’t react to fireworks. Maybe over time, with the right training and consistency I can get over my reactions to other dogs, but you must love me for who I am right now. I think the pluses far outweigh the minuses. Is Your Heart Large Enough for a Doghouse Fire Puppy? We are all drawn to Lu’s Labs Labrador Retriever Rescue for many reasons. Some of us want to adopt Labradors, some of us want to facilitate the rescue of Labradors, and some of us look to Lu’s Labs to care for and find homes for dogs we can no longer provide for. The sad story we want to share today illustrates all those different kinds of Labrador love. On December 14, a litter of 7 puppies was born in Louisiana. Mom is a pure bred black girl, who days before her spay appointment, was visited by an AKC registered golden retriever, Duke, who could not resist the temptation of Misty. The kids in this family begged and pleaded and won the approval of their parents to keep the puppies. Kids and puppies, right? They were made for each other! The puppies came, were weaned, and received their shots and regular veterinary care. On January 31, tragedy struck. The heat lamp in the doghouse caused a fire. The fire was discovered quickly, and all the puppies were saved. Although the owners sustained severe injuries and were rushed to the ER. The puppies have scars, understandably. But, they have all been lovingly cared for with regular penicillin shots, special baths, and creams administered daily to their skin. Their family showered love on them to help them heal, through and through. And, Lu’s Labs has added daily laser treatments to their regular care in an effort to reduce the scarring and increase the healing. Despite this tragedy, these puppies have thrived. The love showered on them by their first family and the careful care that was administered to their wounds have allowed these puppies to be the best they can be. These puppies like all young puppies are playful, curious, and love to have things in their soft mouths. They are scarred. But their labbiness has conquered all and shown though as they healed from this awful, awful calamity. Overwhelmed and understandably exhausted by this responsibility, this family turned to Lu’s Labs to find homes that will continue to show these very special puppies the care and comfort they deserve. So, we come to the third type of person drawn to Lu’s Labs. You, dear adopter. You are the answer to all our prayers. The prayers of these puppies, especially. These puppies who literally survived fire and are now with Lu’s Labs. These puppies, now 4 months old, healed after their misfortune, need you, dear adopter. They need you to continue to love them and cherish them. These puppies are very special. They survived tremendous odds to become a member of your family. There is no question that these puppies will give love freely and unconditionally, as labs do. But also, as survivors of a horror few of us can imagine. Is your heart large enough for a Doghouse Fire Puppy? Please fill out an application on our website and let us know that you are specifically interested in the Doghouse Fire Pups! We have 3 girls and 3 boys available! So how did we catch Sarah? It can’t be that hard, right? Just put up some signs. Watch her. Feed her. Grab a leash. Correct? Wrong. So just how did this whole shin dig go? Sarah left her foster home Saturday morning for transport to Virginia. Sarah was tethered, and the next stop was the McDonald’s in Evergreen, Alabama. However during the drive she stepped on the seat belt clip which unhooked. So when the driver opened the door Sarah jumped out and ran. Sarah stuck around McDonald’s for a bit attempted to go up to some girls but decided to run. She had her martingale collar with an ID tag and a leash attached to it. She was officially in flight mode. In the time Sarah was running and finding a place to feel safe, her foster mom Peggy hopped on the road and drove 2 hours to Evergreen. The transporter Nancy made contact with the local police and they were actively looking, patrolling, and alerting the public. Nancy continued to drive the area looking for any sightings of Sarah. That is what we needed, a starting point. So Sarah is loose in Evergreen, Al. What that hell is there, there. Let me say, some awesome freaking people! Very helpful, kind, concerned people. But other than them it’s just one of those towns between two big cities that has a few restaurants and a couple of hotels. There was not even a place to print flyers. So what to do, who to call? Who can be there with feet on the ground? There were literally no contacts in the area. There were fosters within 3 hours though, who were willing to drive. So Jess and her family hit the road. In the meantime Melissa started a flyer, Janis finished it. Sent it to an Office Depot in Montgomery along Jessica’s route to Evergreen. Jess arrived to OD and there color printer had just broken.... the lady at OD was the absolute best she tried so hard to get it working. When she couldn’t she called the nearest OD which was 12 miles in the opposite direction. When Jess arrived they had them waiting because the lady from the other OD called and told them how important this was. We grabbed what we needed. Sheet protectors, duck tape, and markers and hit the road again. For the next hour from Montgomery to Evergreen Anita wrote reward on both sides of the flyer and Lexi put the flyer in a sheet protector. And Anderson slept. Peggy (Sarah’s foster Mom) had arrived in Evergreen. Nancy had seen her once near a wooded area near a dialysis center. Peggy walked the area, hoping to see her. Absolutely nothing. No sounds. No sightings. Was she still there? No one knew. So Peggy and Nancy drove around continue to look for any evidence of a loose dog running. Nancy’s Dad (85years old) spotted her! Near the road, near the dialysis center!!! Yes she was still in the same area!!! There was a water source!!! Sarah had found her a spot. Jess, Anita, Lexi, and Anderson(the dog) arrive. Jess rolls out a simple short term plan. Anita and Lexi head out to put up signs and talk to local business. Nancy and her dad go searching for an Samsung Galaxy 8 cell phone charger (which in case you wanted to know are impossible to find). Jess gets Peggy set up on the tree line of the area Sarah was last seen, and Jess sets up two food sources. One very close to the water area and one near where she was last seen. Peggy sat in the woods for about an hour with nothing. Jess sat way back near the water source to see if she might be down that way. Again the question was, was she even still in the area. We didn’t know and there had been no sightings. So we stayed in this area. Anita and Lexi came back. Anita took over Jess’s spot and Jess and Lexi went the other direction putting up signs, knocking on people’s doors, making contact with the community. In the meantime, many people from far away more people then I can list begin making the social media pleas. We needed people on the ground. We needed help. A Facebook page was made and shared about 200 times. Pms were going, people were being contacted. Just so much behind the scenes was going on. And it was so hard for all those people because they wanted to be on the ground but were in Fl, VA, NY and probabaly more places. Jess and Lexi came back from hanging fliers and convinced Peggy to go charge her phone and get some food. Peggy was tired, emotional, and so worried she needed to go relax. We were afraid that if Sarah was near she was sensing Peggy’s stress. In the meantime Anita and Jess switch back and forth sitting in the wood lines. The police came by every 20 minutes. Anita heard what she thought was tags but soon after that we got word there was a dog a half mile away in the intersection and cars were having to go around it. Anita, Jess, and Lexi loaded up and and drove there. There was a dog. It was not Sarah. She was a Red Heeler mix. At this point what do we do? Yep you all know. Lu doesn’t leave a dogs behind. So she came back to the dialysis center with us. We named her Eve for being found in “Eve”rgreen. At this point we were not sure if Sarah had been around or not. So Jess went to check the food. Nothing. But it was 38 degrees, so we decided to watch from the car. While sitting in the car talking to Lu coming up with a plan for the next day. She comes out. She lays down near the food bowl. She eats. She slept for about 20 minutes. And then she disappeared back into the woods. We had Peggy go back and sit for a bit. But let’s face it the ground was so cold and wet from the snow and ice in the previous days, if you sat you got wet. And then it was cold. So it was beyond hard to sit for long. There was no signs of Sarah for the remainder of the night. She had eaten (1/4 of a can of dog food) and disappeared. She has bedded down for the night. It was time for us to get some sleep too. So we could be fresh in the morning. We left the last sighting location at 10:45pm to go to the hotel. Well the hotel allowed pets under 20lbs. Ummm we had Anderson at 65lb lab and Eve as 50lb heeler mix. They let us stay!!! No questions asked. Anita and Lexi went and grabbed some food. Jess mapped out a plan for the morning. They got up at 330am and were out and back out on the ground at 4. Jess was on the ground from 4 until 6. Jess swore she kept hearing her but so saw nothing. Anita swapped with Jess, and again kept hearing something but never saw anything. At 7:15 with Anita still on the ground, Sarah was spotted she came from behind Anita and went towards the road. But she came right back down and back into the comfort of her woods a little ways up. Jess decided to go down a ways from where Sarah was seen. Jess found a tree and made that her spot. We were trying to figure of which patch of woods Sarah was in. There were two sets (the road, grassy area, woods, grassy area, and woods) Sarah was active and boy she was getting close to Jess. The more Jess sung the closer she got. Sarah got within 5 feet but spooked when a car drove by. Back into the woods she went. At 8, it had warmed up a bit. So Jess helped Peggy set back up in the wood lines. Jess, Anita, and Lexi went to the local AC so see about a trap. No traps 😞 but such a nice man! Who was so helpful. He scanned Eve for a microchip, no chip. And asked if we needed anything. He took all of our information and shared with a transport group. We went back to the hotel and got smoked sausage and sausage gravy for Sarah (it smelled so go) and checked out of our room. We took the food back out and set it up for Sarah. Peggy went to go get her breakfast and check out of her hotel room. In the meantime a trap was on the way from Mobile! Jess decided it was time to try Anderson. Jess and Anderson walked. Anderson got extremely whinny. So they sat. Anderson was on to something. Within 5 minutes, Sarah was there. She was pacing and watching. She was getting closer and closer. She wanted to come out. Jess was working on commands, playing, feeding, and loving on Anderson. The more she loved on him the closer she got. Sarah was within ten feet of Jess and Anderson. She would go and sleep about 25 feet away and then come back. Her leash was getting stuck which scared her a bit. The trap had arrived and was up by the road. Local volunteers had arrived they were lining the wood line by the road that way she couldn’t cross there because we did not want her too. A local man was told what we were doing and we asked him to stay away. Well we were on the backside of his property so he decided to come see what we were doing. He came up behind Jess and Anderson. Jess spooked and it made Anderson spook which spooked Sarah and she took off running. She ran the direction she had some from and then all of a sudden she came barreling back and went into the woods closes to the road where the other side was blocked by people. We went two hours with no sightings. No sounds. We honestly were scratching our heads did she get past us without us knowing. Somehow Tony spotted her in the brush. She had not gotten past us. She has found a gully, curled up, and went to sleep. The area was wooded. And about 15 feet deep. We were able to surround her. She was dead asleep, Surrounded by the comfort of bushes, briars, and the ground. She felt somewhat safe. Collar did. As Sarah pulled it tighten and Sarah could not slip lose. Tony moved closer. Sarah would not Allow them to touch her. So we passed food and water in to gain trust. Slowly gaining trust they were able to slip a slip lead around her neck. Tony would hand food to Anita. Anita would toss it to Sarah and slowly started offering the food from her hand. Soon Anita was petting Sarah. They were not able to stand so they coaxed her out with Tony in front with bacon strips, Sarah following while eating, and Anita behind with the leashes in hand. They coaxed Sarah all the way back around where we had the trap. We decided to coax her into it. Just give everyone a chance to relax take a breath and to get Peggy to her girl. We can not thank everyone enough who help. Especially the ones on the ground in the Team Sarah picture. Search partners(left to right): Tony Nobles, ARR/South members Leigh, Todd, Kaylee, and Andrew Darby, Jessica Ely, Anderson(yellow lab), Peggy Robertson, Anita Ely, Susan and Tony Scott, and D Todd Grier. Not pictured is Lexi who is taking the picture. The directors who were behind the scenes helping brainstorming ideas, keeping each other calm 😬 or at least trying. The people in Evergreen and the omg the police officers who were so awesome. All the shares we got, advice, offers to help. Each one of you were amazing! We may have not done things by the books. But it was a successful rescue! And it took a village!! Oooo and Eve! Eve stayed in Evergreen with ARR/south members who will be updating us along her journey!!! Sometimes things go wrong by no fault of a dog, and humans are, well human, and they make mistakes. 90% of life is not about what happens to you, but how you react to it. Logan, our darling black lab boy, about 4-years old and loves every human he meets - escaped on transport around 9:45 pm on Saturday night. Accidents happen. Logan was able to back out of his crate as he was being loaded onto a transport van at a busy Pilot truck stop in Tuscaloosa, Alabama. Still attached to his bright green Lu’s Labs slip lead, he actually stayed out of reach but stayed around the truck stop for a couple of hours. Amid Christmas parties, evening activities, and weekend wind downs, the Lu’s Lab community of volunteers, and rescuers beyond, mobilized. Flyers were made, there were eyes on the ground with our local rescuers in Alabama searching, sighting him a couple of times under trucks parked for the night, along pathways, and also dangerously close to a busy highway. The hardest part when a rescue dog escapes, in a stressful situation and an unfamiliar place, is that you just don’t know how they will react. A usual happy go lucky dog like Logan at first tried to approach a few people. But, through a comedy of errors, and misreading his intentions reactions spurred him off to a more stressed out state. Once this happens with a scared dog, approaching the dog can be perceived as chasing. Chasing means to Logan, “I have to get away.” And I have to get away means being driven further off course. At one point Logan ducked for cover into a drainage pipe in a culvert under the highway. In the meantime, the executive team of Lu’s Labs began putting together a game plan and got together lost dog flyers to get down to Alabama for printing. By Sunday morning with boots on the ground a coordinated effort of volunteers were blanketing the area with flyers, receiving information and sporadic spottings, that couldn’t always be sure were Logan. After 36 hours of no sightings, the founder and president of Lu’s Labs, Luisa, put everything on hold in Northern Virginia to jump on a plane and head down to the Tuscaloosa, AL. Tuesday evening she secured her rental car, a place to stay, and met up with Jennifer McKinley, our Southern Foster Director, along with a dedicated team of volunteers and rescuers who had been tirelessly working to find Logan since his escape on Saturday evening. Animal Control was involved and helping with rescue efforts. They were ready with traps and when sightings occurred around Woodland Forrest, traps were set to try to catch him. One volunteer contacted local radio stations who pulled together and posted on their websites and twitter feeds. Social media was instrumental in bringing in people. The lost flyers were shared over and over, and rescuers that were not even connected to Lu’s Labs joined in the search. More and more sightings let us know that he was still attached to his bright green slip lead. Sometimes it was apparent, but sometimes it wasn’t seen. It was actually a blessing and a curse that he was still attached. This helped mark him as our black lab boy, but at the same time there was a fear that he was caught on something that could become a dangerous situation for him. Luisa brought with her squeaky toys, field cameras and other equipment to help her catch Logan. With no recent sightings, she helped rescue another lost dog that had alluded animal control for a few days. And of course, no trip to Alabama would be complete without visits to the shelters, and falling in love with a couple of dogs that just had to become Lu’s Labs. Jennifer, a native to the area, and also the first point of contact on the flyer and thus was getting all the sighting reports - began to see a pattern of where Logan was roaming and saw he was making a tighter and tighter triangle. On Wednesday night they staked out two ends of the path he was traveling. Lu and her crew were grilling out in a field on one side of the perimeter trying to draw Logan in with the smell of stinky foods, while Jennifer was by an area where other spottings had occurred. Her singing actually attracted Logan, but again, in his heightened state of alert, he alluded her. The key really was to ignore their natural instincts and not look behind them whenever they heard sounds. That’s right, a bunch of women in the woods ignoring their conditioning to look at rustling in the hills behind them. The goal was that he would either come to them, or hopefully go in a trap. On Thursday morning, they heard the trap had a dog! Could it be Logan? No it was another dog. Thursday night they repeated the process and swapped sides of his traveled path. By this point so many people had spotted a friendly black lab attached to a green leash, hanging out by fences, following home some girls who were singing, roaming around, but no one could really get close enough to earn his trust. On Friday morning Luisa was preparing to head home to Virginia, while the plan for other volunteers was to keep up the search. This is when the news came. Logan had been caught in the trap! And Billy from Animal control, who was born for this job, with his total dedication, was able to harness Logan and along with Jennifer getting another slip lead on Logan, they were able to get him into Jennifer’s car and let Lu know the great news. Lu immediately canceled her flight and made arrangements to drive all the way back to Northern Virginia with Logan. With a bursting heart, happy to know Logan is safely back in the nest, Logan’s Journey isn’t over yet. His big adventure is only just beginning as he heads for his Northern Foster. This dedicated team of rescuers, volunteers, and good Samaritans went above and beyond to make sure Logan had the chance to find his forever home. While at time's Logan's Journey was scary, at the end of the day, his escape led to the capture of two other stray dogs, and 3 other lucky labs making it into Lu's Labs where they will also find their forever homes! Remember always live in that 90% of how you react to the world and good things will come! End Note and Many thanks Abbreviated From a Post by Luisa Paucci: Luisa Paucci would like to personally thank many of the people who were involved in the search. Of course Jen McKinley - The Southern Foster Director and her tireless dedication from the moment we got the news of his escape. Lisa PIzzato - Lisa was out handing out flyers, camping out with Lu, and was instrumental in the search for Logan. Amy Eades Anderson - Also camping, distributing flyers, and involved intensely with the search. Arianna Curreri Bastian - involved in a lot of our transports, was immediate feet on the ground and brought her dog Duke to help in the search. Tracey Walker Dies - who brought the grill, fed us, camped out with us, and was dedicated to Logan's recovery. Maddie Towers - Logan's foster mom, spent countless hours looking for her boy, showered him with love, and made him the incredible dog he is. Steve Lamon - made giant signs for us and helped in the search. Myra Alexander - Feet on the ground the very first night. Kathleen Johnson - Who contacted the media and got the word spread far and wide. Linda Wilson - who brought us hot chocolate, blankets and chairs during our camp out. The amazing efforts and involvement of Tuscaloosa Animal Control - Billy, Miguel, and Trent. Thank you for being so incredibly supportive, helpful and responsive. And on a very personal note, Luisa knows she has her husband in heaven supporting her through difficult times like this past week. Loving memory to Rick Harrelson. And of course, the countless number of people who shared and liked posts on social media, reported spottings, and were caring in the face of a lost dog.